Hello Friends. 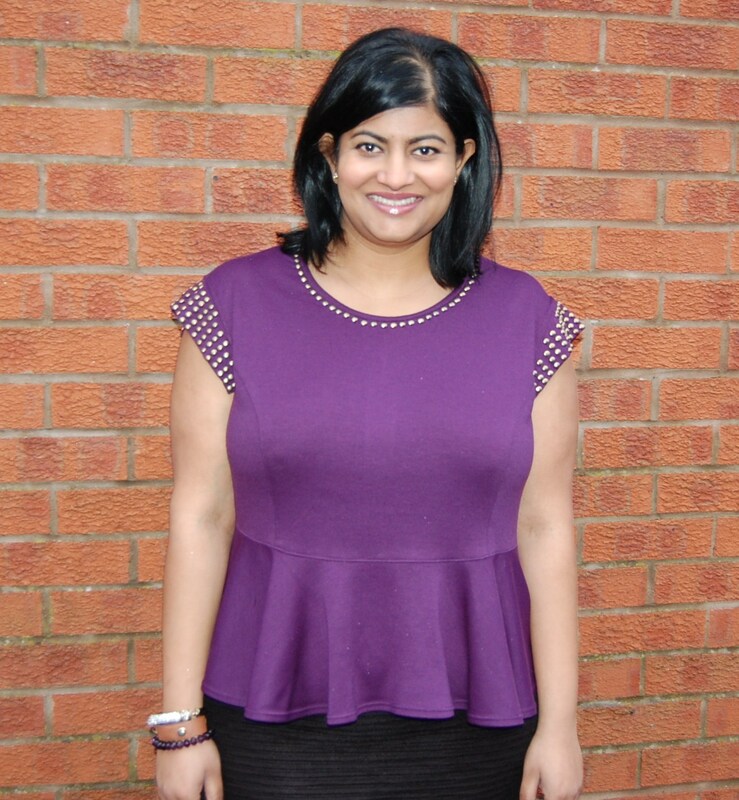 Today I wanted to share with you a ponte peplum top that I made using Vogue 8936 and some delicious aubergine ponte fabric supplied by my sponsors, Click Fabrics. I also made the easy, pull on pencil skirt using a remnant piece of fabric that I purchased some time ago from Click Fabrics (you can see what I originally made with this fabric here). More on the skirt shortly. First let’s talk about the peplum top. Vogue 8936 – the Vogue version: what you looking at?? Slightly scary right? Not having had much success with Vogue 8815 (unblogged), the thing that attracted me to this top was the princess seams and the fact this is one of those custom fit patterns. The pattern itself is “ok”. I am not too thrilled with the final fit. I think it’s too big in the shoulders and even on the waist I could have gone down slightly. However, because of fabric limitations I went with sleeves from New Look 6123 (they lend themselves better to the studded effect I went for anyway), and I don’t mind the droopy shoulders too much 🙂 Vogue once again have not provided a neck-waist measurement; I had to guess how much to shorten the back by and I feel perhaps if I was making this top again I would add maybe an inch to the length, front and back. For a top like this I think it’s pretty crucial to have the peplum sitting on your waist, and not half way down your back. 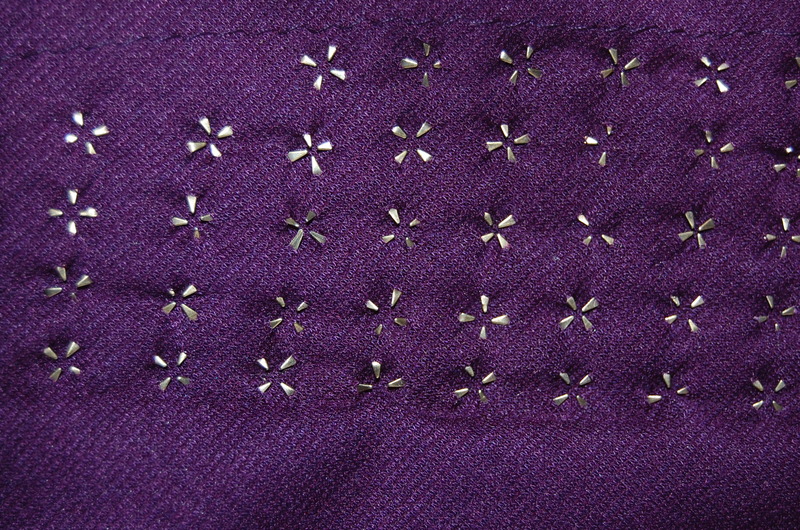 Wrong side of fabric showing studs in place. I used antique brass studs and love the effect they gave. They were easy to use; just push through the fabric and bend the prongs in to place to secure. I used approx. 250 studs for this top, and yes, it is not a quick job. I studded the front and back of the sleeves. On to the skirt. I used this tutorial as a basis for drafting the pattern for this skirt, using my own measurements, and I love the end product. It’s soooo comfy. I would say that the tutorial has you adding on 1 inch seam allowances and doesn’t take into account that you probably need some negative ease built in to get a good fitting skirt, but taking in the side seams got me where I wanted to be in the end. Also, I finished the waistband of the skirt by serging on a band of 1 inch wide elastic to the top of the skirt and folding it over twice before stitching in the ditch of the side seams to secure. MISSES’ TUNIC, SKIRT AND PANTS: Close-fitting, partially lined tunic has princess seams, peplum, and narrow hem. A: wrong side may show on back hemline. B: stitched hem on sleeves. Semi-fitted skirt or tapered pants have contour waist. All have back zipper. C: back slit. Custom fit for A, B, C, D cup sizes. Yep. Although I didn’t follow them exactly. See below. The edgestitching on the seams. I think I shortened the back by about 3 inches and did a sway back alteration (Next time round I would lengthen front by 1 inch and shorten back by only 2 inches). I lowered the front neckline by approx. 2 inches. I omitted the lining and instead used strips of ponte cut on the bias as facings. I used an invisible zip. I substituted sleeves from New Look 6123. I added approx. 250 antique brass studs to the sleeves and neckline. I don’t know if I would sew it again as is, but it will be handy to have a princess seamed bodice with sleeves suitable for ponte knits in my stash 🙂 It does need some tweaks. Yes, I would recommend it. Happy new sewing year readers! What a fun look! Lovely color on you. I love your top- that color is gorgeous on you and those studs are cool! I need to make a skirt like that! Thanks Shannon. I Definitely recommend making a skirt like this; easy peasy and comfy! Stunning. You can really see the hard work you put into the top with the studs. Very cool effect and brilliant idea. Thank you Shelley. Actually very simple to do. Wow, the studs look great. Love your skirt too. Fantastic! I can’t believe your finished top came from that pattern – the pattern photo looks so scary. 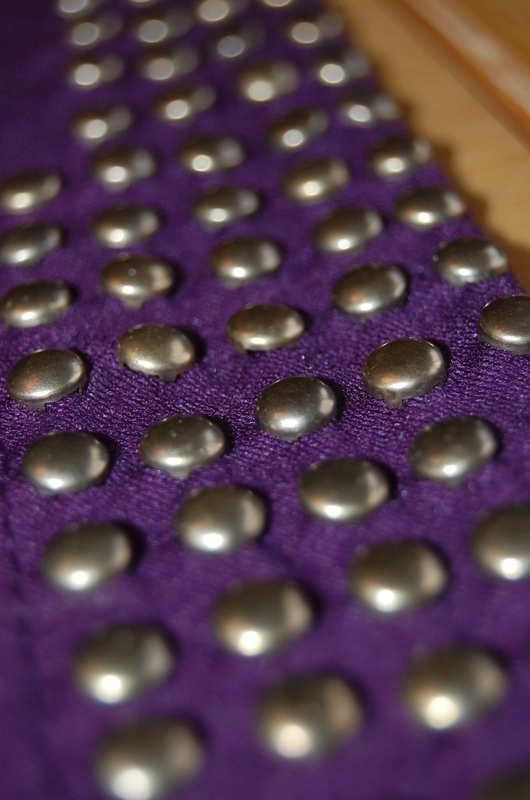 Love the studs, it must have taken you hours to apply them so neatly. Thanks Sam. Well I would say it took maybe 5 – 6 hrs in total to do all the studs? Roughly? Happy New Year! What a great top to kick off sewing for 2014! My DD1 is stud crazy, but I just don’t know where to start. 250!!! And one at a time, too. Great top. Thanks tia Dia. Even just studding a neckline in 30 mins could make an impact. Try it out or getting you DD busy! I mean get DD to do the studs. Great top. Especially love the studs. It is really pretty. It looks MUCH better than the pattern picture. Thanks for stopping by my blog. I plan to follow yours. I like your style! Thanks zibergirl. I love your blog! Cute outfit, love the bright color and the studs! I love the skirt in particular. The fabric is perfect for it.